During the darkest days of WWII, as Hitler’s war machine attempted to pound Great Britain into submission, Vera Lynn became synonymous with the indomitable spirit of the British people. One of the most celebrated performers of the 1940s, her hugely popular radio shows, recordings and films endeared her to the public, helping to reinforce Prime Minister Winston Churchill’s ‘never give up’ spirit. Performing such classic songs as ‘We’ll meet again’ and ‘The White Cliffs of Dover’ the ‘Forces Sweetheart’ made a significant contribution to the moral of British and Allied soldiers during WWII. Her unwavering support for the troops saw her performing tirelessly, travelling to Burma, Egypt and India, often in hostile conditions. In fact such was Vera Lynn’s universal appeal that many a Luftwaffe pilot risked disciplinary action to tune in to the BBC just to hear her voice. 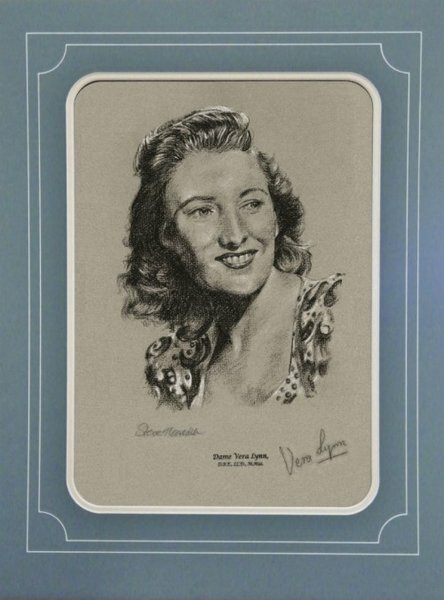 March 20th is Dame Vera’s 100th birthday, and to commemorate this milestone we are proud to release this outstanding edition from the Military Gallery archives, which was published a number of years ago in support of the Dame Vera Lynn Children's Charity. Reproduced from an original work, in charcoal and pastel by portrait artist Steve Teasdale, each print is personally autographed by Dame Vera, giving enthusiasts the opportunity to acquire a unique and historic collector’s item. Dame VERA LYNN CH DBE OStJ Performing publicly from the age of seven, by the outbreak of WWII she was a rising star on the radio with her own solo records and, after being overwhelmingly voted as their favourite entertainer by servicemen, became known as ‘The Forces Sweetheart’. During WWII she had her own radio show, appeared in several musical films and worked tirelessly to entertain troops around the world. She was commended for her ‘courage and contribution to morale’ after performing outdoor concerts in Egypt, Burma and India, often in hostile conditions, and received the Burma Star for entertaining troops in Japanese occupied Burma. After the war she continued an incredible career as a singer and songwriter and in 1952 became the first British artist to have a No.1 record in the US, remaining there for nine weeks, and at the same time had a remarkable three records in the top ten on the first UK singles chart. In a career spanning over 70 years her last public performance was in 1995 at Buckingham Palace. She is the only artist to span the British charts across 60 years from its inception in 1952 to becoming the oldest living artist to have a No.1 album in 2009 at the age of 92. Having devoted much of her life to charity, she is regarded as a ‘National Treasure’ by WWII veterans and the public alike and will become the oldest person to release a new album to mark her 100th birthday.